In an effort to restyle Cairo into a global capital that would meet the demands of tourists and investors and to achieve President Anwar Sadat's goal to modernize the housing conditions of the urban poor, the Egyptian government relocated residents from what was deemed valuable real estate in downtown Cairo to public housing on the outskirts of the city. Based on more than two years of ethnographic fieldwork among five thousand working-class families in the neighborhood of al-Zawyia al-Hamra, this study explores how these displaced residents have dealt with the stigma of public housing, the loss of their established community networks, and the diversity of the population in the new location. Until now, few anthropologists have delivered detailed case studies on this recent phenomenon. 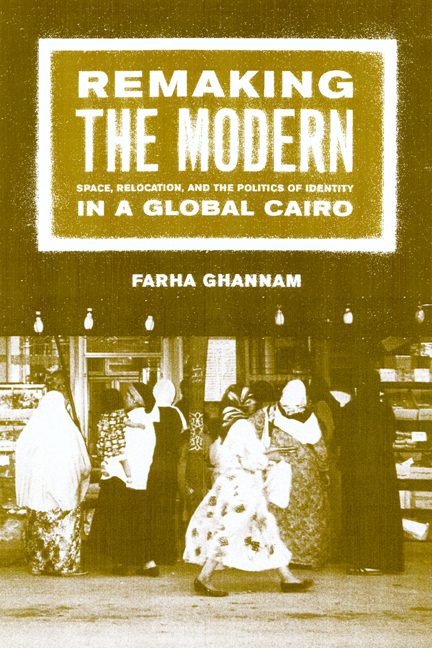 Ghannam fills this gap in scholarship with an illuminating analysis of urban engineering of populations in Cairo. Drawing on theories of practice, the study traces the various tactics and strategies employed by members of the relocated group to appropriate and transform the state's understanding of "modernity" and hegemonic construction of space. Informed by recent theories of globalization, Ghannam also shows how the growing importance of religious identity is but one of many contradictory ways that global trajectories mold the identities of the relocated residents. Remaking the Modern is a revealing ethnography of a working class community's struggle to appropriate modern facilities and confront the alienation and the dislocation brought on by national policies and the quest to globalize Cairo. Farha Ghannam is Visiting Assistant Professor at Swarthmore College in Pennsylvania.